“Can magic teach us how to love?” asks Sabrina Scott partway through their graphic essay, “Witchbody: A Graphic Novel.” As Scott builds up layers of radical environmentalism and transformative animism through the book, the answer crystallizes: yes, magic can teach us how to love, because empathy and experience are the way forward, and magic gives us the tools to learn and practice both. While it is difficult to pin down a single thesis for this essay — perhaps only because the scope of Scott’s topic is so broad — one clear theme is that through the intentional sharing of spaces and bodies, and the experience of other bodies in relationship to our own, we come to know, understand, and love each other. By experiencing pain, grief, loss, and transformation, we learn to recognize and honor these experiences in others, and in the world around us. By seeing ourselves as we truly are, what we share and where we differ with others, we come to be one. More a poetic essay than a narrative, “Witchbody” is a book which muses about ontology, experience, physicality, and spirituality — and what these things all have to do with each other. Scott’s beautiful ink and watercolor illustrations enrich their words, lending reinforcement to their message through the depiction of interactions between humans and the liminal spaces that guide us between and within our urban and natural environments. Scott’s magical attitude takes flight as everyday activities are transformed into moments of transcendent beauty, during which awareness and empathy inflame a daily sense of unity with the surrounding world. Man, earth, and animal engage with each other on a daily basis. In these watery, organic panels, bones, phones, ferrets, and flowers all float down the same stream as the self; all inhabit one sphere and collide with each other in the same space, as one body. And in these bodies, and in our shared body, we can suffer pain, illness, and death — and when we deny the truth of our shared body, we truly do damage to each other. At the same time, our sensuality is a gateway to ontological understanding; by having a body and engaging with our own bodies, we can come to understand what it means to have a body, to be a being in the physical, natural world. But Scott does not praise only sameness or the recognition of shared traits by different bodies; while this is an attractive shortcut, it can also invalidate more experiences than it validates, and ignores a lot. Instead, Scott delves into how the self-as-same and self-as-different juxtaposition propels animistic empathy forward, causing true transformation and understanding through primary experience and communication, rather than analysis, reflection, or judgment. It is in the active compassion for the other that we build the bridge between our own experience as human individuals, and the experience of the others, by extending our own capacity for feeling and our borders past our own skin. Sabrina Scott’s “Witchbody” is a beautiful book which will appeal to animistic and environmentally-minded witches, artistic witches, and anyone who believes that we are all one. While there is more text here than in a regular graphic novel of the same length due to the dense and complex nature of the content, it’s still an easy afternoon read that will leave you eager to experience how engaging with the natural other can strengthen and sustain our collaborative, shared world. We talk a lot about circles. Holding ritual circles. Creating a sacred circle. Building a power circle. And different Pagan paths have their own ideas on how circles should be created, crossed, and taken down. Circles serve one of three purposes. They are either built to keep things in, to keep things out, or both. Going back to 101 basics, for those who are still learning, circles built to contain are generally used when doing energy raising for spellcasting or healing. Circles built to keep out are used when doing work that may attract unwanted energies. And those which do both, well that’s pretty self-explanatory, you may be doing energy work that you want to contain while at the same time you want to keep out any unwanted energies. Through teachers and personal experience I have developed my own ways of working within circles. More often than not, when I am working alone I don’t create a circle at all. And until now I couldn’t have told you why that is. I just knew intuitively that it wasn’t needed. Each of us has a circle around us at all times. We may call them shields or boundaries, but really they’re just permanent circles. We don’t cut doorways in order to move about. Reach out with an arm, and the circle expands outwards. Our circle travels with us where ever we go. My personal circle isn’t a circle though. When I think of a personal circle, I see in my mind a hula hoop, orbiting my waist. No, my circle is not a circle, it is more an oddly shaped sphere. When I move an arm, the circle expands outwards to keep my arm covered. When I walk around, my circle stays right there with me. Dodge left or right, yup. Still with me. Because my shield is always present around me, I have found that I don’t need to go through a specific process to create a circle when I am doing spellcasting or following my personal spiritual practices. I may re-enforce my shielding, but I don’t rebuild it from scratch. If I am with people that I am very close to, such as my children and a few very good friends, my personal circle will expand to enclose all of us together. If I am in a crowd or amongst people I don’t know or trust well, my personal circle will shrink down so that only I can be within it. Larger circles are needed to contain larger groups, so at those times I will create a purpose-built circle, one that again is not so much a circle as a sphere. It encloses all who are within it, but also moves and expands as needed and gently enfolds any who may come to join the circle. So, the next time you create a circle, spend some time actually feeling it and playing within it. See where it is, and what you can do with it. Is it firm and unmoving, or flowing and flexible? Can it do the work you are intending it for? If your intention is to contain energy in order to raise it, is that energy contained? If your intention is to keep out unwanted energies, are they kept out? Either way, how do you know? Can you feel a difference between personal circles and group circles? How do group circles change depending upon who is within that circle? Above all else, circles are not passive, they are created and influenced by every person within that circle. Being a Military family, we are often sent to places we might not necessarily want to go, sometimes with not a lot of notice, our worldly belongings are packed up into boxes by men who sweep through the house like a whirlwind, they are then shunted into containers and shipped thousands of kilometres, to be unloaded by yet another set of removalists often into a house we may not even like. A home, so recently vacated by another family doing the very same thing, it can feel like crawling into a stranger’s empty bed, while it is still warm from their bodies. No matter how well it is all orchestrated, it is often a very stressful time for the family, time spent in temporary accommodation waiting for the ‘belongings’ to catch up, kids moving schools, making new friends. However, as an empath and home maker it can be emotionally and spiritually traumatic – if I am not careful. I always thought it would be wonderful, if I could have a day in the empty place before we moved in to ‘clean house’ but that is rarely possible, so it is up to me to cleanse and claim as best I can amidst the boxes and chaos.. It is important to me, to make my family a home as quickly as possible. A warm environment, where they feel safe and cosy, as well as a welcoming and comfortable spiritual space as well. The latter is hugely important to me. One of the first things I do armed with sage, cedar and sweet grass, is smudge the house… I clean the floors with a herbal wash, drains and sinks are cleaned with salt and lemon… the doors and window sills are sprinkled with salt. I ask the deities I work with to bless and protect… I cleanse out space. As our household and personal items are often handled by packers who see items in boxes as nothing more than a reason for a pay check, it is often good that our belongings are shown some love with a good cleansing as well. 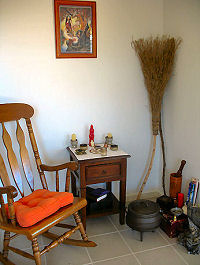 The next most important thing for me is to set up “sacred space” – I have done this in every house and there are little areas, dedicated to different deities about the place… a wee love altar in our bedroom dedicated to Aphrodite, in my kitchen Hestia is guardian of my hearth and Hecate resides in a main living area. I have always had a place set up in our home, where I can go and sit and recoup, a place where a table is dedicated to the elements, incense is burnt here, candles are lit here, hands are clapped to music here, drumming happens here. This is my space; this is the area of the home from where energy flows to every corner. It is a place of grounding. That one place I can just look at, or walk past and feel the closeness to and the blessings of the God and Goddess. There are so many stressors in life these days, work, school, deadlines, even a trip to the grocery store can be like running a gauntlet. It is so beneficial to us to have a place within our homes or gardens where we can get in touch with that still small voice inside. It matters not the path you walk – to set up a small place that becomes your power place is a very easy thing to do. Let yourself be guided to the place, you will ‘feel’ the right one, it could be a shelf with a few personal treasures, a corner where perhaps you can set up with a comfy chair and a wee table, adding things that are have meaning to you. 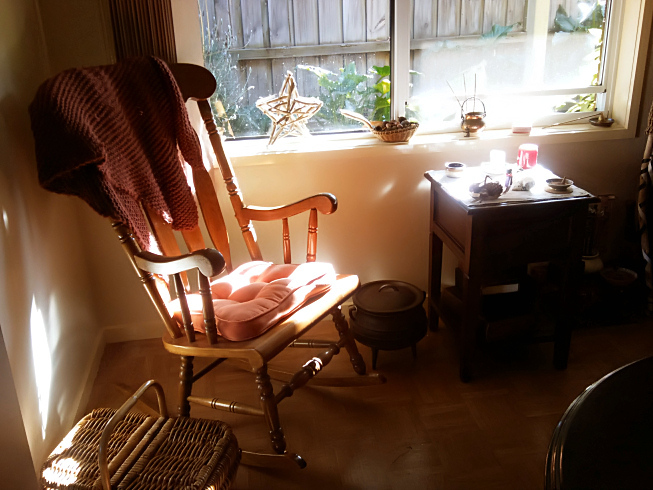 Spend some quiet time there, make it yours… I know for myself having sacred space within the home has helped me through things that have felt insurmountable… With the somewhat transient life we lead, I have managed to make space – my first frontier. I close my eyes and I transform from the home I know, to the home that is me. No longer am I standing in an apartment of wood and metal walls. I am standing in a field. The view is amazing. All around I can see golden wheat tickling my fingertips as I walk. My field is in the middle of this beautiful forest. All around me are trees as far as the eye can see. They protect my little home and keep me safe. It will always be here when I return. The animals watch over it. The air is crisp and clear. All around me is warmth and love. The smell in the air is home to me. I feel at peace, nothing like that of the life I lead, but a serene peace from deep inside my soul. I smell earth and everything that she holds dear. Around me the sounds of birds call me. Owls, strangely out at day, come to “Who” at me. I can’t see any animals around me, but I know they are there, watching me. In the middle of my field of gold is a wonderful cabin. It is a log cabin and when I look at it, it gives me such happiness. It is what I have always dreamed of. Most homes for me have always been a simple four walls, but this home is everything I have ever wanted. I know once I step into it, there will be a massive expansion that I can do whatever I want with. I can have it be an elegant mansion or a simple cottage. Today, the cottage suffices and it is exactly what I want. The round archway of the door beckons me to come inside. Find what I can explore. Before today, I could never make it in the archway. Something always held me back, not allowing me to go in further. Truly I have been awakened spiritually and realize that the power to overcome whatever obstacle stands between me and the door is mine. I can go in. Nothing will stop me now. My hand grips the handle on the door and I push it open. Inside is the living area. I have a cauldron in an old fashioned fire pit on the left wall. The chimney takes all the smoke from what is cooking inside the cauldron. The smell continues to be earthy, but this time, it is homier. Like herbal soups. There is a bed in the middle. Made of wood and very big, it has a homemade quilt on the side. Something I always wished I could do on my own was making a quilt. I always wanted one that I could pass down from generation to generation. This one is old and well loved. In it is the spirits of witches that have come and gone. I know that this one will be handed down to my own child, but which one I am not sure. One will have a great power and decide to do wondrous things with it. I lie on the bed and close my eyes. My familiar, a small white dog that seems to change breeds whenever she chooses, lies next to me. She warms me with a glow that seems to work on its own. When I open them, I have returned home in the real world. My sacred place I will visit again soon, but for now, I must become the mother, wife and witch I am in reality. When I first started learning about energy and the sacred space, my husband decided he would try to take me to mine. Since I am a water sign, he tried to tell me to picture a beautiful ocean. My body and soul would not let that happen though. I kept coming back to my cabin, waiting for me in my golden field. It beckoned me and no matter how hard I would try to get to that ocean he was telling me to be at, I couldn’t get there. Sometimes, I believe, you don’t have an option where your sacred space is. It is a home given to you, not one that can be chosen. Some people say that they have made theirs, but I can’t seem to get anywhere but my cabin. Who would want to in all reality? It is a beautiful place and feels so right to me. I don’t even want to leave. So what does that have to do with being a kitchen witch? Well, I mentioned the soup, right? I want to share a special recipe for soup with you. This is an herbal remedy of sorts. It is great for those with stomach problems, and very tasty. I was told to eat a bland diet when I had a stomach issue and it was supposed to be something close to a liquid diet, and I am not so good with liquid diets, so I compromised. I made a soup, but not so much just blah. This one has a lot of meat in it, but I also want to add a barley and mushroom soup for my vegetarian friends. Start your broth in a large stock pot. You want to bring this to a nice heat before adding your other items. While that is heating, in a large sauté skillet, add onion and garlic. Lightly sauté then add each of your meats individually. You want to brown them before adding to the stock pot. Once they are all in the stock pot, bring to a boil and then simmer for an hour. After about an hour, you want to add your seasoning and vegetables. You can add salt, thyme, bay leaf and pepper to taste. You want to simmer for another half hour to get the flavors to mesh well. It will serve about ten, so make sure you have a large stock pot. For my Vegetarian friends, here is a Barley and Mushroom Soup for you. Now, bring your broth to a low boil. Reduce your heat. Add your mushrooms, onions, carrots and celery. Allow this mixture to simmer for ten minutes or so. Add the barley and garlic and allow it to simmer for another hour. You will want to use salt and pepper and any other seasonings for taste. With Beltane right around the corner, these will be in your pocket for a great celebration with family and friends. From my family to yours, many great blessings in your sacred space and home without.